Warcop Parish Council has now opened a new section of Warcop Cemetery for natural, woodland burials. This was initiated by Bob and Enid Laidlow and the Parish Council sought advice from Eden District Council in drawing up the necessary guidelines and location. 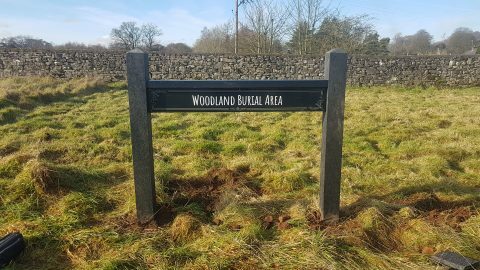 Sadly Bob passed away recently but it is fitting that he should be the first to be buried in the new Woodland Burial Area. The intention of this area is that all burials will be natural, using biodegradable materials. There will be no head stones but small trees and natural flowers will be permitted. The area will only be strimmed or cut once or twice a year to allow it to develop as a natural corner of the cemetery. Copies of the regulations, guidelines and costs can be found attached below via links, and photographs of the area, the new sign and hedge planting are in a separate gallery on this website. Anyone interested in reserving a plot in this part of the cemetery should contact the Clerk to the Parish Council, Heidi Strong on 017683 41102. Angel of the North - Glenda Burton!